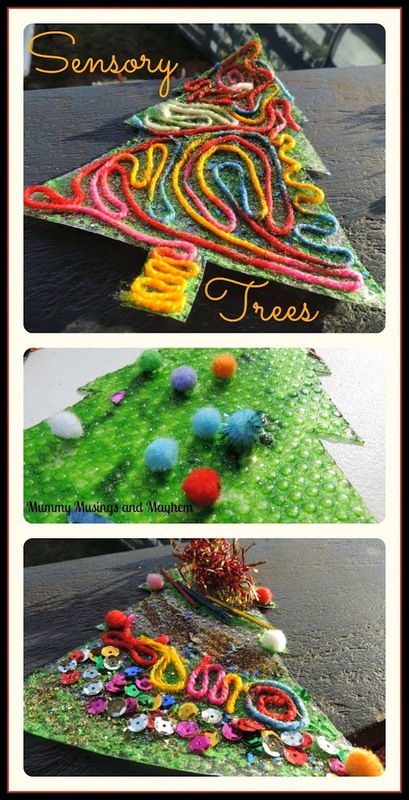 Christmas is nearly upon us and I am seeing beautiful Christmas crafts everywhere I look! I tend to keep craft pretty simple though when we have a holiday theme or I find I get to stressed and the kids don’t enjoy it much either. I do enjoy trying to incorporate some different experiences each time we do something ‘easy’ though. 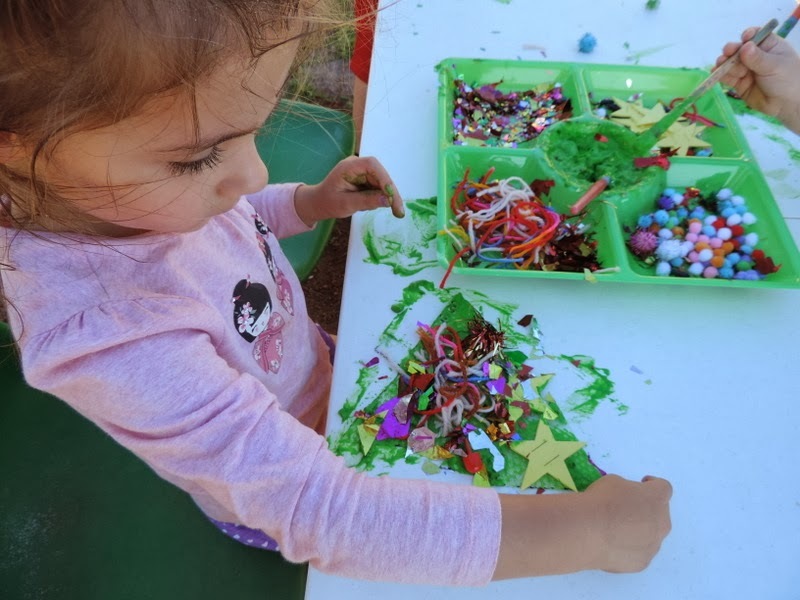 Our sensory Christmas trees were simple enough for the toddlers to enjoy doing but provided enough scope and challenge for the older children to get a little creative and extend their imaginations. 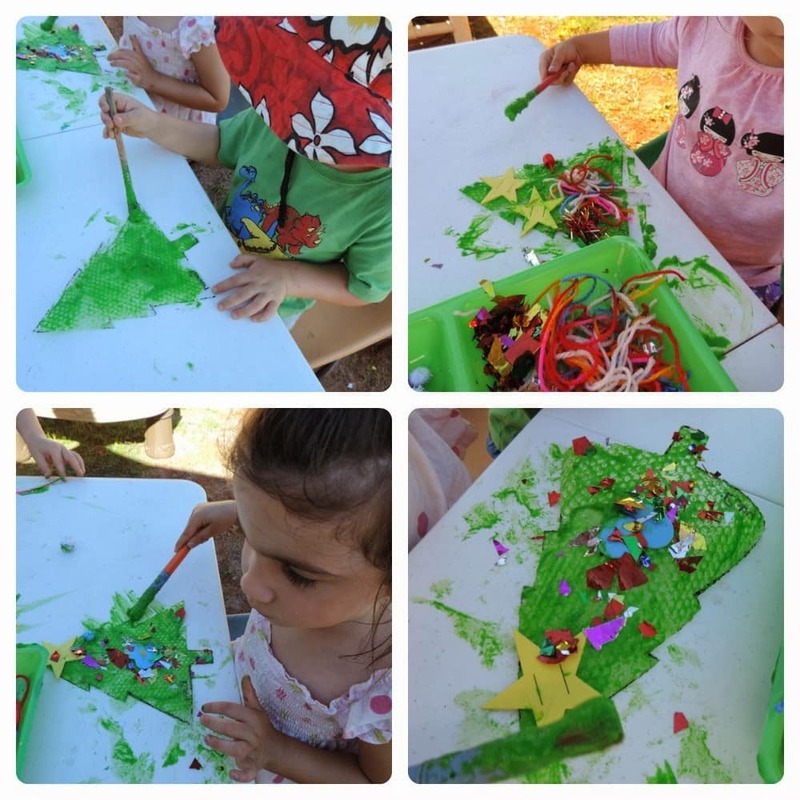 It also provided a fun sensory experience as they decorated their trees leading to lots of discussion and investigating. Why not give them a try? They are quick enough to fit in before Christmas is here and they look so pretty adorning the walls or windows! Glitter…optional but I do love glitter at Christmas! 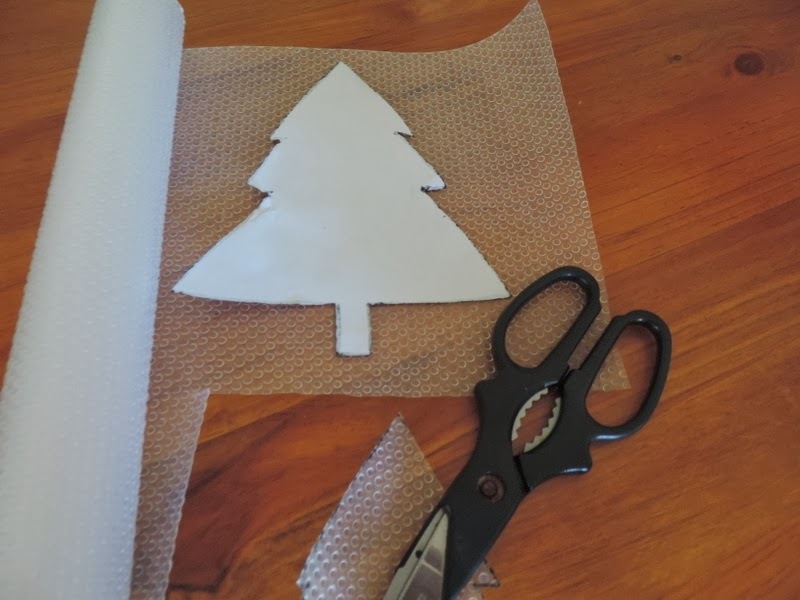 I drew a basic Christmas tree template on paper and then cut it out to use as my stencil (If you don’t have time to draw up a tree there are lots of stencils online you can just print out quickly). 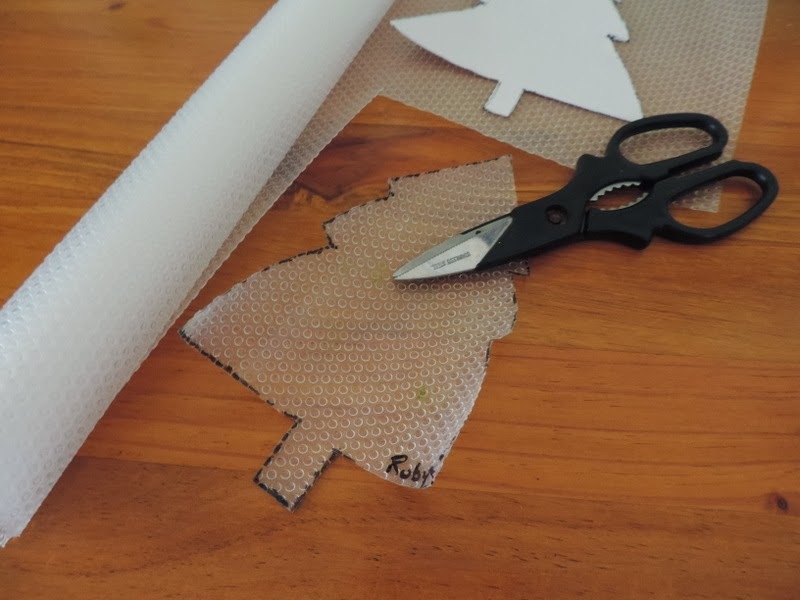 Lay your tree stencil on the plastic roll and cut out as many trees as you think you will need for each child and then do some more because they will ask you for more…trust me!! 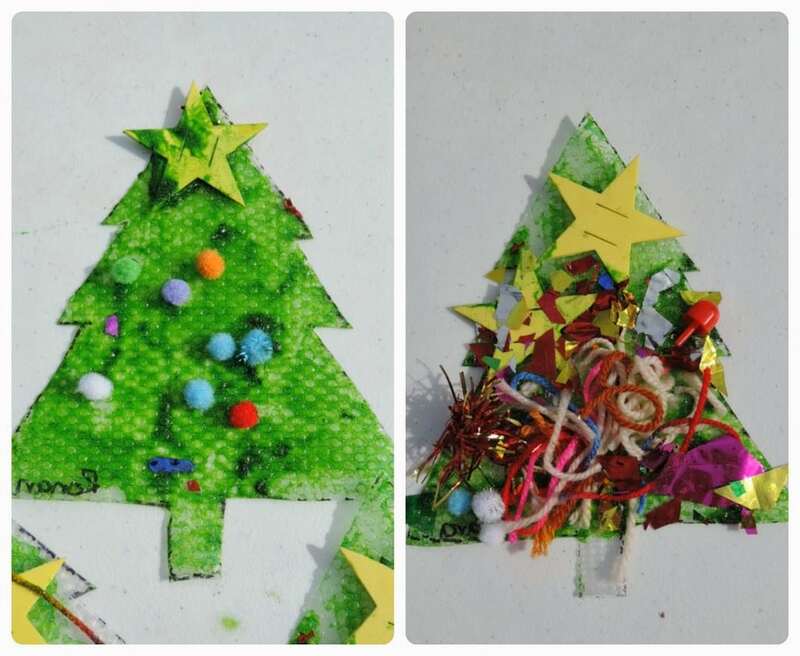 If you are making the trees for a group of children then I suggest putting a small name down the bottom at this stage because it is very hard to write on them with all the glue and glitter later! Don’t throw away the offcuts…if you cut your trees out fairly close together you will get offcuts that with a little trimming make an easy Christmas tree puzzle toddlers can have fun putting together and pulling apart. 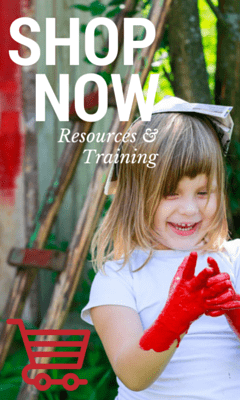 I do love a budget friendly activity don’t you? Now lay out your chosen collage materials and a little glue paint and then let them decorate to their little heart’s desire!! I love that children will always do even the simplest activities in different ways. With the family day care group in the pictures below , some used lots of glue and collage, some used only a little. Some preferred to just add paint and a star and some like my Tara covered the tree in colour. There is of course no wrong or right way to be creative! We painted with the bumpy side up so that the children could feel the bumps as they painted and as they stuck down their collage pieces. We talked about the other side feeling different and what ‘smooth’ meant. 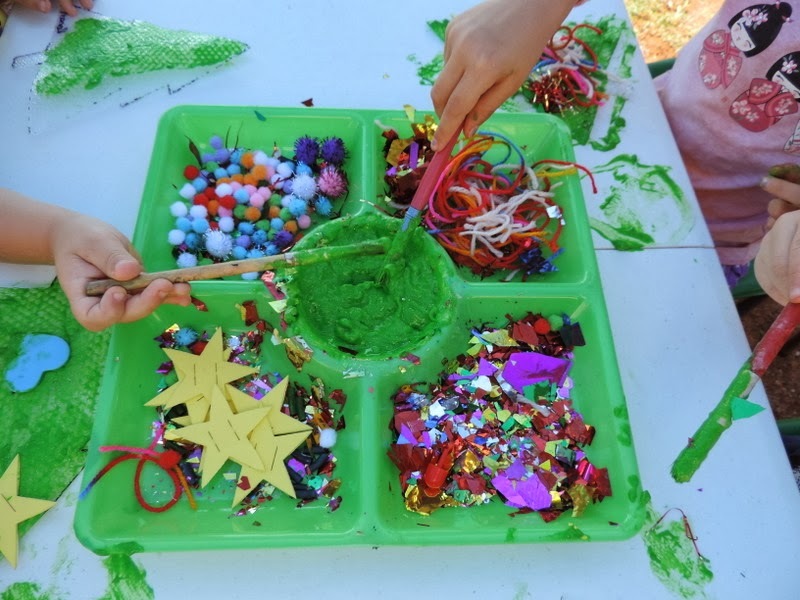 Glitter, sequins, glue and soft pom poms all added to the sensory aspect of the activity. Those that found the sensory touch of the bumps too challenging for their system simply turned it over and decorated the smooth side. 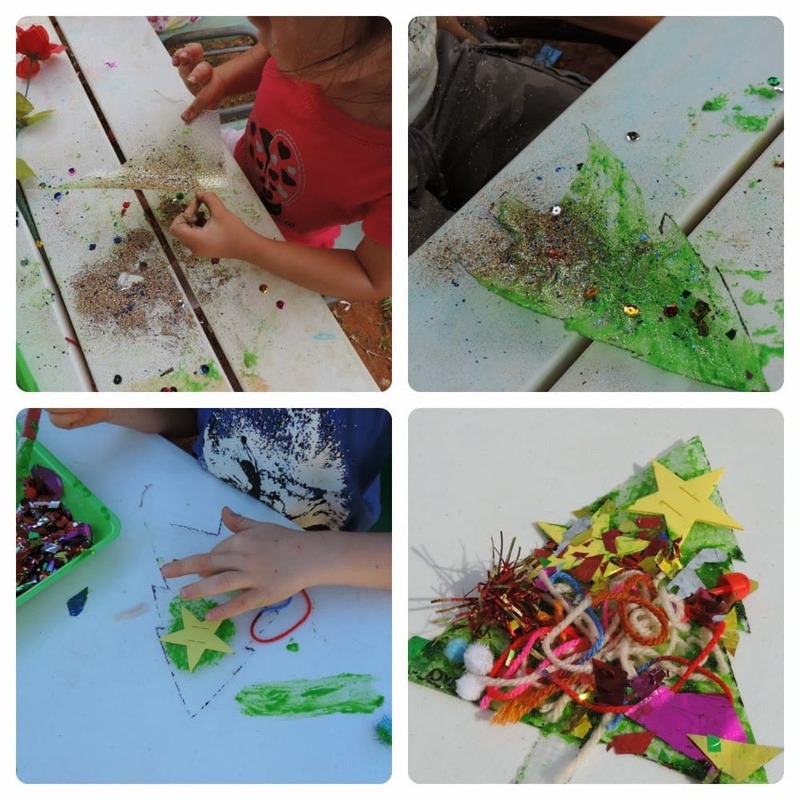 I found it interesting that every child chose to put a star at the top of their tree so I would encourage you to include a few little stars in your collage material. 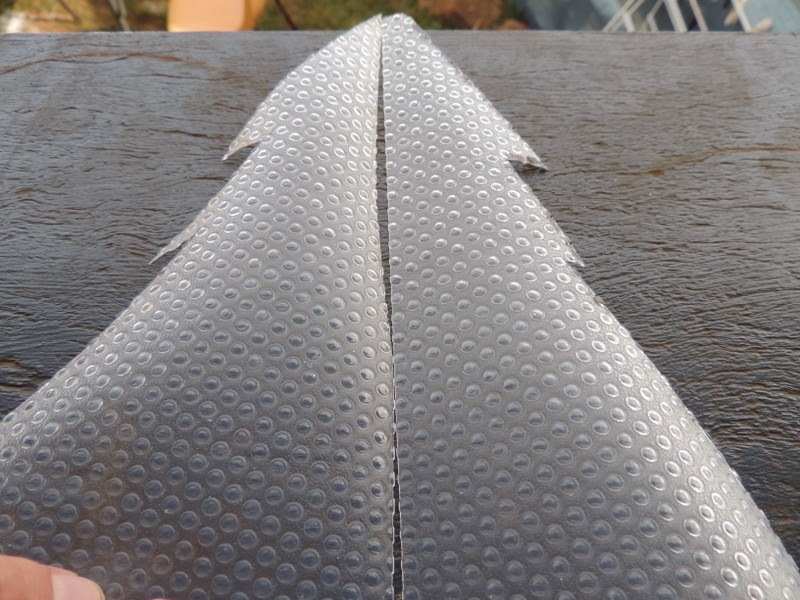 These are just little foam ones but there are lots of little foil ones around at the moment too. 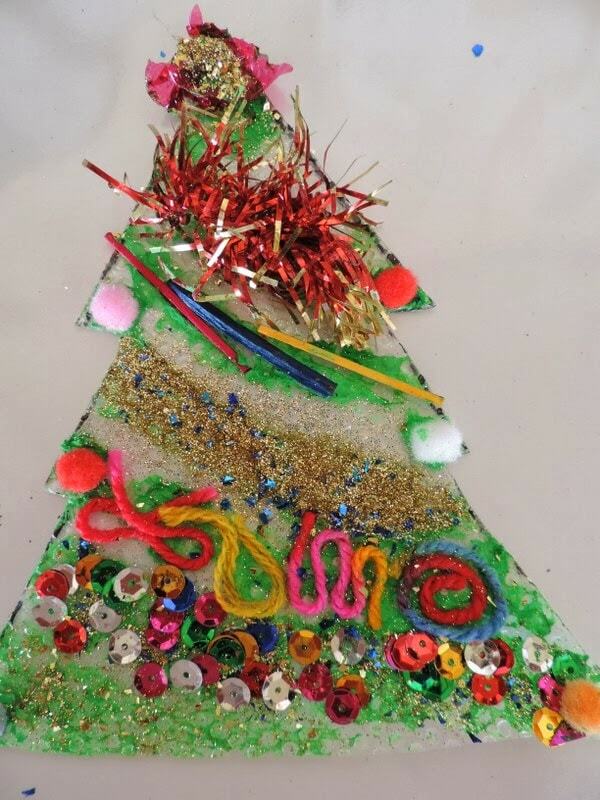 And glitter…there was lots of glitter….but the lawn looks lovely and festive now! 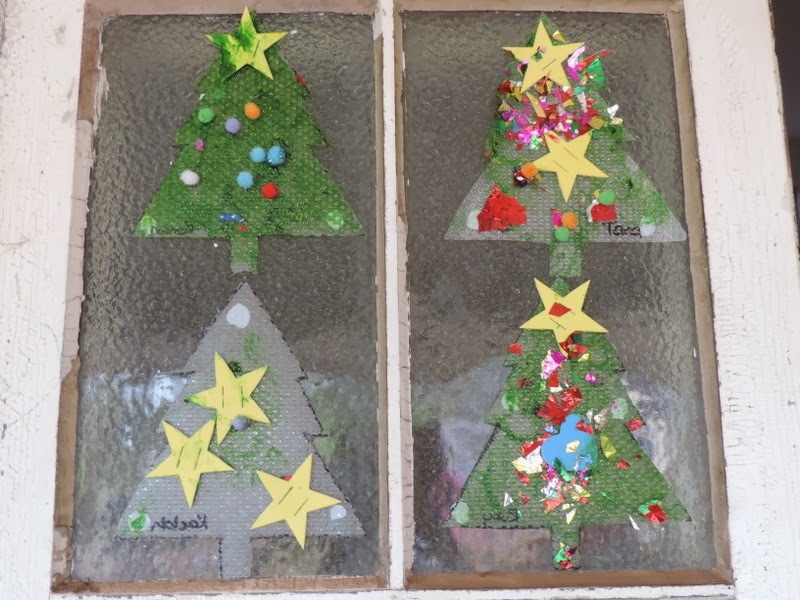 The chosen decorations varied but they each displayed their own unique style and the children were very proud of them. They have really brightened up the old windows in our sign in area too! An easy craft but one that all ages can participate in and enjoy…Miss Teen actually spent quite a while on her designs and the younger children loved watching her create beside them…aren’t they pretty? 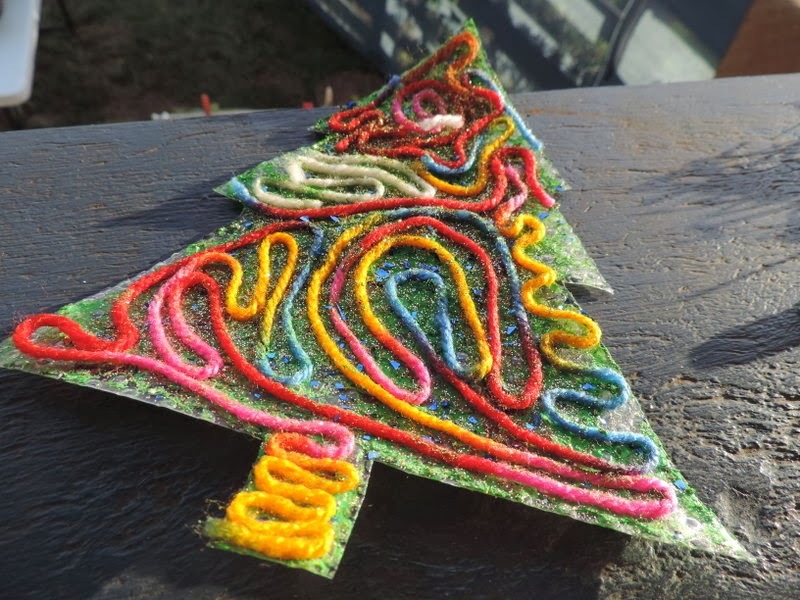 What’s your easiest Christmas craft? 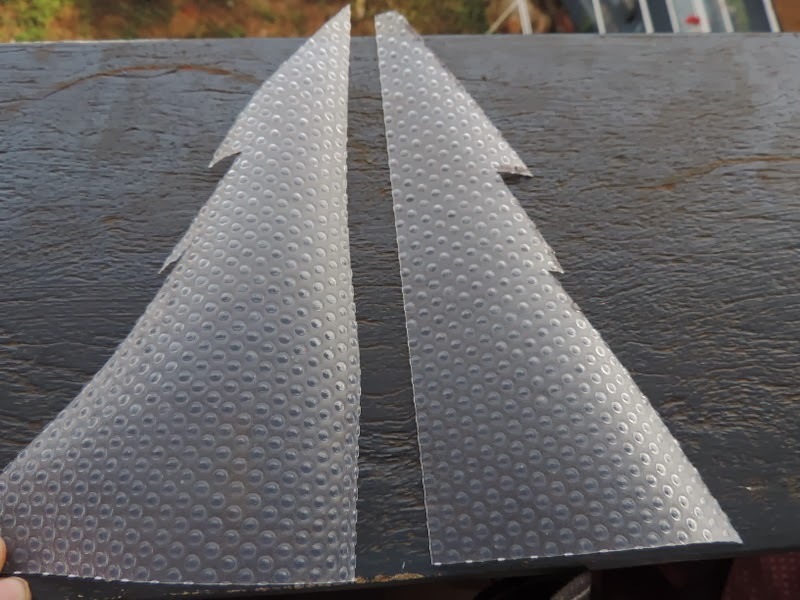 « DIY Christmas Bells & the new Dettol floor cleaning system! Wow this is a lovely idea and one I would love to do with Aarya too. Pinning it! 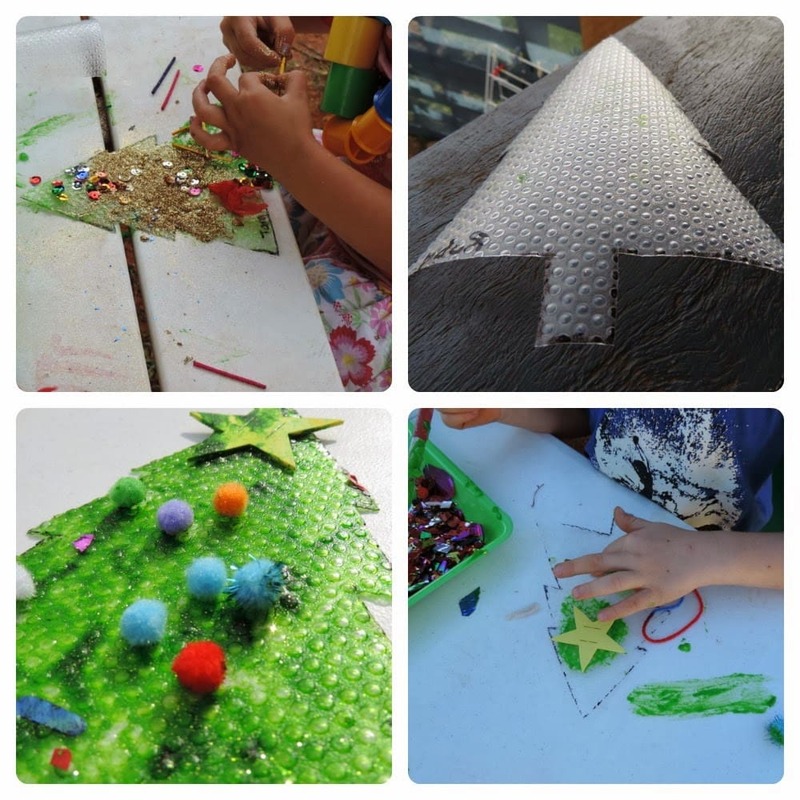 Projects such as this is really good because it brings out the creativity of the kids. I love this….but not sure what the tree is made of…..is it bubble wrap? Question. 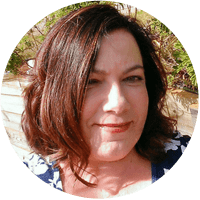 i love to set upcraft activities for the kidlets but find myself looking blankly in my cupboard that has plenty of supplies…i always seem to want it to be “perfect”..any tips on how to “let go”?